Advertisers, agencies and publishers are looking for options for delivering brand advertising campaigns via digital video ad formats, the first IAB Europe Video Ad Formats survey reveals. Based on a survey of approximately 700 advertisers, agencies and publishers from across 31 markets, the study provides insight into the video ad formats landscape across Europe, including the current usage for brand advertising campaigns, trends and technological specifications. The research reveals that there are three dominant formats across all devices in the European video advertising market which are the in-stream pre-roll format, out-stream in-article / in-page format and broadcast 30 second spot. These formats lead in terms of current usage, trends and ROI across the industry with little variation between advertisers, agencies and publishers. 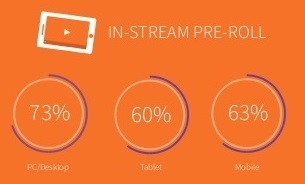 •	Out-stream formats are more popular than in-stream in some regions, for example respondents in Western Europe have increased their use of the out-stream in-article / in-page format more than pre-roll. •	The results suggest that the buy-side is executing cross-media video advertising campaigns as more than two thirds of agencies are using the broadcast 30 second format across all devices and the 30 second ad duration is the most popular across all video ad formats. •	PC / Desktop is the dominant device for video advertising as all formats are used frequently on this device but stakeholders are looking to expand across devices as the increase of video ad formats usage was strong on both PC / desktop and mobile. The buy-side is particularly looking to extend their video advertising messages across devices, for example over 80% increased their use of pre-roll on mobile devices in the last 12 months. •	Advertisers and agencies are also not only looking to expand across devices but also across formats and are turning to out-stream formats to do so; more than half of buy-side respondents are using the in-feed format across devices. •	On the sell-side, publishers are also looking to out-stream for further choice suggesting they are aiming to update and improve the layout of their content and pages; more than half are using the in-article / in-page format across all devices. As stakeholders seek more choice they also aim to eradicate their use of more intrusive formats; overlay and interstitial formats are said to have decreased by the highest number of respondents. Video advertising is a key topic within the IAB Europe’s 2017 annual plan and is driven by the Video Ad Formats Task Force. Other recent outputs include the Attitudes to Digital Video Advertising report. The topic will also be explored further at the annual IAB Europe Interact Conference on the 23-24 May in Amsterdam. Download the European Video Ad Format Landscape Infographic and Report here.